What would you do if, upon your untimely demise, your soul was transferred into the body of an automatic rifle owned by an active soldier of war? Your new life would be one of unceasing bloodshed, your sole purpose to bring pain and death as you fire seemingly endless rounds of shrapnel, willingly or otherwise, into whoever your owner decides to point you at. And then there’s the existentialism of it all. Are you still human? Can you feel pain? What happens when your owner dies or loses you, leaving you to gather dust as an inanimate entity forever, until years of rusting and degradation finally brings an unceremonious end to your meaningless suffering? These are the kinds of deep, philosophical questions I would immediately begin to ponder should I ever take the form of a firearm, but Gunnar, who finds himself in this exact predicament at the beginning of Rogue Trooper Redux, doesn’t seem to be having nearly as much of a dilemma. In fact, he loves being a gun, whooping and wahooing all the way as the titular Rogue himself (GI44, as he’s known to his friends) uses him to pump bullets into a growing mountain of foes. That outlandish tone and leftfield conceit is part and parcel of Rogue Trooper Redux’s appeal but, if you have no idea who Rogue Trooper is, it probably sounds like the ramblings of a crazy person, so allow me to elaborate. A popular character from the 2000 AD comic book series (the same home of Judge Dredd, no less), Rogue Trooper is part of a genetically perfected army of soldiers, which is a handy thing to be in a dystopian solar system where war ravages on in an infinitesimal cycle of death and destruction. After being betrayed by one of their superiors and falling into an enemy trap, the entire G.I. (genetic infantrymen) force gets wiped out, and Rogue is there to watch all three of his best friends die before escaping the battlefield as the last remaining G.I. Rogue Trooper, developed by Rebellion (the Sniper Elite people), was first released in 2006, and retold that exact same origin story through the framework of a third-person shooter. The game’s novel cover mechanics, tactics-focused gameplay, and faithfulness to the source material quickly turned it into something of a beloved cult classic, and it even re-released for the Nintendo Wii in 2009. Fast forward 11 years, and Rebellion has remastered the game in the form of Rogue Trooper Redux. It’s due to release on October 17 for PC, PS4, Xbox One, and Nintendo Switch (hurray! ), but I’ve already put quite a bit of time into Redux’s first six campaign missions, and can offer some thoughts on how I’m finding it so far. They say a film is only as good as its script, and perhaps the same can be said for licensed video games and their source material (though that would make Aliens: Colonial Marines the glaring exception to this rule). Accordingly, the world of Rogue Trooper is such a uniquely interesting one, that Redux already has a lot going for it in terms of standing out. Even if you ignore the whole ‘my dead friends are sentient pieces of military equipment’ thing, Rebellion successfully integrates much of the fiction’s original quirks into the gameplay. You don’t heal yourself via med-kits, as you might in a traditional shooter, but with the aid of a creepy robotic arm that emerges from your backpack to jab syringes into you whenever you ask Bagman to do so. You can also turn Gunnar into a stationary turret, allowing him to draw the enemy’s attention, cackling and hoora-ing the entire time, as you circumvent the battlefield and deliver killing blows with your powerful pistol. The way in which the comical surrealism of 2000 AD’s universe bleeds into the mechanics of Rogue Trooper Redux is where the game has always excelled and, so far, that doesn’t appear to have been lost in this remaster. That said, the graphical overhaul to Rogue Trooper’s visuals - which includes remodelled assets, improved lighting and effects, and a full HD upscaling - doesn’t do a perfect job of hiding the game’s age, at least from what I’ve seen right now. It’s impressive in parts, but this isn’t a Crash Bandicoot N.Sane Trilogy type remaster built from the ground up, and Rebellion has instead done the best it could in polishing up the code of a decade-old shooter from the sixth console generation. The striking imagery of the campaign’s early moments (hundreds of blue men falling through the air, a swirling skyscape lit up by cosmic rifts and the endless barrage of artillery fire) remains as powerful as it did in 2006, and the framerate is silky smooth, but bland facial animations and drab textures are an off-putting reminder of Rogue Trooper Redux’s age, especially if you’re playing without the rose-tinted goggles of nostalgia. In 2006, Rogue Trooper was ahead of the game (or games) with its comprehensive cover system. That’s an important milestone that ought to be appreciated but, in a post Gears of War and Uncharted landscape, Redux’s cover mechanics only serve to remind us just how far the genre has come since then. Getting in and out of cover never plays out quite as smoothly as you’d hope, and throwing grenades or blindfiring from behind a wall lacks any measure of control or accuracy. Outside of cover, things feel much better, and playing around with GI44’s abilities for offensive, defensive, and covert means of engagement quickly became my favourite pastime in these early stages of the campaign. If there’s one quibble, it’s that the strange input lag between switching weapons and reloading seems like something that ought to be addressed by a remaster such as this one, though getting used to its rhythms does add another unintentional layer of strategy to the gunplay. 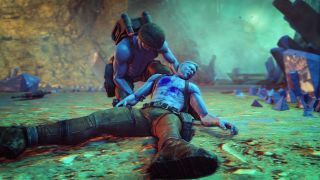 From memory, I know that Rogue Trooper’s campaign only gets better as it goes on, with character progression and the increasingly open level design allowing the game’s tactical layers to really flourish, and I’m hoping that the same can be said for Redux when it finally releases in a few weeks’ time. What I’ve played so far, then, has been flawed fun, and the remaster appears to maintain all the highlights and shortcomings of the original without too much in the way of major reworkings. For fans, this might be exactly what they were hoping for. If you’re not familiar with the game or the source material, though, make sure you know what you’re getting into before you jump aboard, as Rogue Trooper’s barmy world of blue men and gibbering gadgets really is as crazy as it looks.